Boarding at 4pm ready to embark on our once in a lifetime Kimberley Cruise adventure. Enjoy a quiet drink and some nibble’s as you settle into your cabin. Then join us on the top deck for a glass of champagne and meet the rest of the guests as we watch the sunset on day 1. See us at sea as we travel towards the Berkeley River. We will have plenty of time to settle in and meet new friends and fellow guests. We will also have the opportunity to view some movies of the Kimberley so we can all get excited and may even crack out the darts or bingo! Wake up this morning to the glorious Berkeley River and take in the inspiring vista from the top deck as we make our way up one of the great Kimberley gorges. Keep an eye out for the first of many crocodiles (bigones inhabit this river!!) and the chance to see a Jabiru on one of the mud banks. Once we can travel no further in our mother ship we will disembark into the tenders for a scenic cruise and maybe a chance to catch an elusive Barra for those who are keen. After lunch we will head back down to the mouth of the river and back into the tenders to view the Casuarina Falls and maybe a swim. As the sun sets enjoy a relaxing drink as we set sail for the mighty King George. Once we have traversed the protective sand bar at the mouthof the magnificent King George, we will meander our way alongthis Kimberley icon to it’s falls. Be sure to have your camerabatteries charged as you will need all you have to capture every photo opportunity!! Once at the falls we will stop within metres of them and then disembark into the tenders for a closer look. Those that feel upto it can make their way to the top of the highest single drop falls in Western Australia for one of the truly great views. In the afternoon we will set sail again for Vansittart Bay. Vansittart Bay! One of the best places to view Bradshaw paintings. Wonder as to how these mysterious and elegant paintings came to be. 20,000 years old and looking like nothing you have ever seen before. We will also visit a downed DC3 plane from the war and learn about the secret WWII airbase that housed hundreds of B52 Bombers that the Japanese searched for in vain. At the end of the days adventures we will head for a nice refreshing dip in the sea on a tranquil beach. Today sees us in the mighty Mitchell River, home of the big Barra. A chance for everyone to hook the fish of a lifetime. We will spend the day here catching dinner and trying our hand at mud-crabbing as well. For those who feel up to it, there is great waterhole to soothe the days adventures away, safe from the ever present crocodiles. For those who would like to see the Mitchell Falls there is an option to take a helicopter ride and enjoy the view. 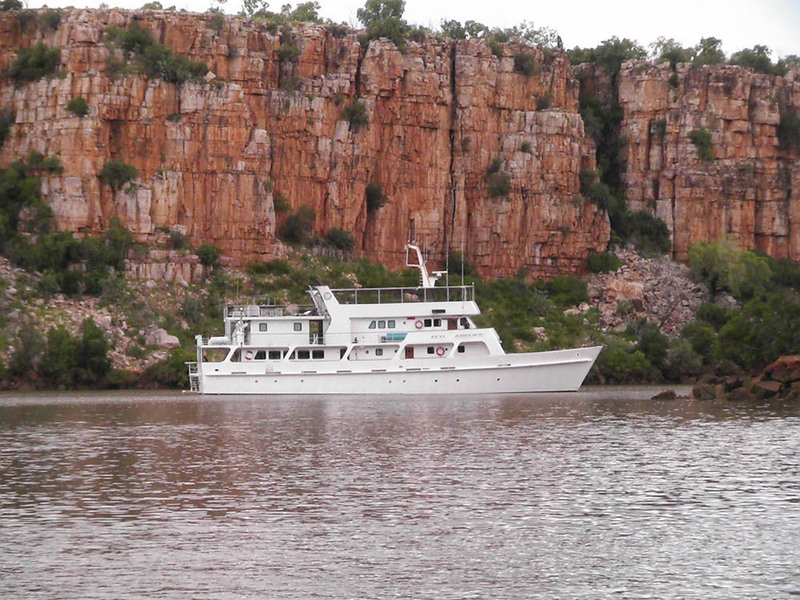 Halfway through our Kimberley Cruise we visit Bigge Island, where we have a saltwater swim and walk on a beautiful sandy beach. We explore some beachfront caves to look at Wandjina art and a burial site of one of the Wunambal people. This afternoon we will head off to the Hunter River and try our luck at spotting some whales whilst enjoying a drink or two on the top deck. Wake up to the magnificent sandstone cliffs of the Hunter River. These spectacular rock formations change colour as the light comes and goes and as we spend the day sightseeing and fishing. There is also an option today to take a helicopter ride to the Mitchell Falls. The infamous King Cascade and the Prince Regent River, once thought to be the access to a great inland sea. Today we get up close and marvel at the King Cascade waterfall and learning a little of the history about the discovery of the Kimberley Region. We will enjoy a swim at the top of the falls in another great waterhole and more chances to catch the elusive Barra. In the afternoon we will cruise down the river and watch another gorgeous sunset as we make our way further south. Waking up in Brecknock Harbour, we take an early morning run in the tenders to view the remains of the first Kimberley settlement and hear the tales of woe that beset this misinformed and tragic expedition. From here we will cruise past the famous Kuri Bay, the first Pearl Farm in the area and down to an art gallery at Freshwater Cove. You will have the chance to purchase our own little piece of history and do a bush tucker excursion with some of the local people. Just another fascinating remembrance of your Kimberly Cruise. Montgomery Reef, so named by Phillip Parkerking, in honour of his friend and surgeon on his exploration of the Kimberley coast. Witness the spectacle of this monolithic reef as it rises out of the water. We will sightsee up the channel and experience the many turtles, sharks, rays and egrets there are in this incredibly diverse system. In the afternoon we will steam across Doubtful Bay and enjoy another refreshing swim in a surprising waterfall and another chance at the golden Barra. After breakfast this morning we will head to Raft Point and view some more beautiful Wandjina art and learn the history of the area. Then it’s onward towards Freshwater Cove and its exquisite art gallery run by the locals. This afternoon we will steam off and take in the beautiful scenery as we make our way to one of the world’s great natural wonders….. The Horizontal Falls. White water rafting anyone? Well not quite, there is an option here to take a ride through the Horizontal Falls in tenders and experience one of the most exciting parts of the trip which is not to be missed. In our last hurrah of our Kimberley Cruise before heading to Broome we will visit Silica Beach (time and tide permitting). Truly a standout in a sea of beaches. This beach is so named because of the amount of Silica in its snow white sand. Hear it squeak underfoot as you relax one last time on the shores of the Kimberley and start planning your return journey, for no two trips are ever the same.